Blessey Marine Services's success in managing safety is a reflection of an 11-point safety philosophy. While each Blessey Marine vessel is responsible for their own safety efforts, they are all joined in basing those programs and systems on a common safety philosophy. These principles have given direction to hundreds of safety activities and initiatives on Blessey Marine owned equipment that travels every major waterway in the United States. The first and most basic safety principle at Blessey Marine Services is that all injuries are preventable. This may seem a startling idea in the context of a lot of marine operations, but we have lived and worked with this core belief since 1978. In fact, our performance demonstrates that this principle is workable. We are able to prevent injuries because of the fundamental belief that injuries are, by their nature, preventable. Second, we believe that management, from the top of the corporation to our deckhands, is responsible and accountable for preventing injuries. One of management's fundamental responsibilities is to lead the safety effort in a sustained and consistent way, establishing safety goals, demanding accountability for safety performance, and providing the resources to make the safety program work. The third Blessey principle is that the combined energy of the entire organization is necessary to continuously improve and excel in safety performance. While leadership's role is critical, everyone must be connected to and have personal value for the drive for safety excellence. The fourth Blessey safety principle is that all operating exposures that could result in injuries or occupational illnesses can be controlled. This principle is closely related to our fundamental belief that all injuries can be prevented; it's really a question of controlling the hazards. No matter what the exposure, an effective safeguard can be provided. It is preferable, of course, to eliminate sources of danger, but when this is not reasonable or practical, supervision and the work groups involved must specify measures such as special training, safety devices, and protective equipment. Our fifth safety principle states that safety is a condition of employment. Safety starts on the first day someone begins working for Blessey, and each employee is expected to be conscientious in assuming personal safety responsibility from that first day on the job. Each employee must be convinced that he or she has a responsibility for working safely. The sixth safety principle is the acknowledgment that employees must be trained to work safely. Awareness of safety does not come naturally; we all need to be trained to work safely. Training must include both skills and motivation. Effective training programs to teach, motivate, and sustain safety knowledge are a key element in preventing all injuries and illnesses. Regular audits of the workplace are the subject of our seventh principle, which is that management must audit performance in the workplace to assess safety program success. Comprehensive inspections of both vessels and programs not only confirm their effectiveness in achieving the desired performance, but also detect specific problems and help to identify weaknesses in the safety effort. After an audit is completed, all deficiencies must be corrected promptly. This eighth principle recognizes that whenever a safety deficiency is found - either by an audit or investigation or in the normal course of work - prompt action is required both to overcome the hazard and to reinforce the message that safety is a priority. Blessey believes that safety is part of every job, but safety is also part of every person's life. That's why the ninth principle is a statement that off-the-job safety is an important part of the overall safety effort. Employees should not "turn safety on" as they come to work and "turn it off" when they go home. Both the employee and the company become safer when the employee internalizes safety. The tenth safety principle recognizes that safety is good business. Injury prevention is one part of creating competitive advantage. Injuries cost money, and their cost undermines competitiveness. Safety excellence is part of overall competitiveness and is therefore an integral part of all business activities. The last principle is the most important of the Blessey safety philosophy. Safety must be integrated as a core business and personal value, recognizing not only that good safety is good business but that it's important for each member of the business to have a personal value for their own safety and the safety of the people they work with. It is our people who provide the solutions to our safety problems. They are the one essential ingredient in the recipe for a safe workplace. Intelligent, trained and motivated employees are any company's greatest resource. Our success in safety depends upon the men and women in our company. 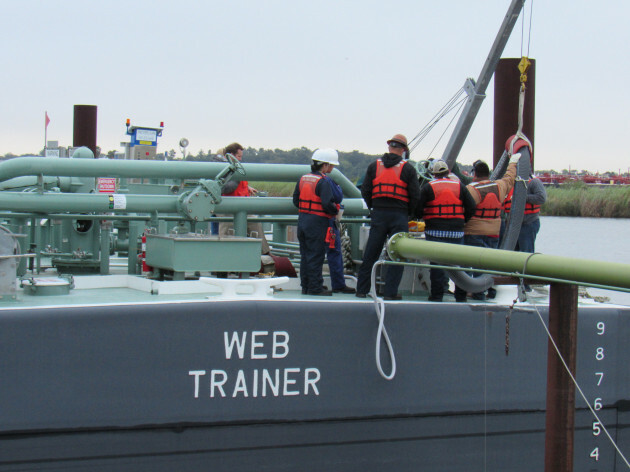 They contribute to the overall success of Blessey Marine by following procedures, participating actively in training, and identifying and alerting each other and management to potential hazards. By demonstrating a real concern for each employee, leadership helps establish a mutual respect, and the foundation is laid for a solid safety effort.